Welcome to day two of The Brent Crawl. If you haven’t read about day one there’s 1,800 words of mostly family friendly writing on that very topic available by following this link. If you have read it, and you’re back for more, thanks! Day two of the Brent Crawl was, by far, the longest of the trip. It was also the one in which I made a number of poor decisions, a couple of which had lasting implications for the rest of the week. On the plus side, it was also the best day weather-wise of the trip, so at least I was making bad decisions in the sunshine. Clear skies, calm water, can’t lose. I woke up on White Trout not long after sunrise and was happy to see no sign of the thunderclouds that had chased me north the day before. The sky was perfectly clear, the water was calm and there were no aquawolves treading water just offshore. So, three for three on the “things that bode well for a day of paddling” checklist. The water was like glass as I pushed off, headed north towards Big Trout. I had a vague goal in mind of making it to Burntroot, and deciding there whether to stop for the night or continue onwards towards Cedar. I, of course, already had permits telling me where I was supposed to go, but I was already off my original route and not likely to get back on it due to the unexpected amount of double carrying I was doing. Rerouting in the middle of a trip can be problematic. The park asks you to book in advance for a reason. Well, a number of reasons, all of them good. Having your route pre-booked means you can be tracked down in the event of emergency. It also means that you’re not taking a site on another lake from someone who has actually booked that lake. There are, of course, always reasons why you might not make it to your booked site (wind, injury, dramatically overestimating your capacity for portaging a metric ton of unnecessary food all over the damned Park, etc. ), but by and large it’s much better to stay on permit. Staying on permit also reduces the opportunities for confusion regarding whether or not you can actually stay on a lake, and would certainly reduce the chance that you end up doing 10 km more than planned for the day, with the sun setting and a nagging suspicion that you’re having a heart attack, but we’ll get to that. Right now we’re enjoying the early morning on White Trout. White Trout was a nice paddle. Smooth water and pretty scenery makes for a good start to the day. There’s a lot of history on the lake, including the remains of the McLaughlin Farm Depot along the western shore. The clearing along that side makes it pretty obvious where the Depot once stood, and is a neat reminder that the Park used to have a lot of permanent and semi-permanent habitation. Directly opposite depot is a series of impressively tall cliffs that overlook the biggest part of the lake, providing what I imagine is a great view west. I’d like to revisit White Trout and camp at one of the sites at the base of those cliffs. It’d be cool to climb up there and take in the views, maybe set up a zip line across to the Farm Depot. (Dear Algonquin Park Zipline Placement Committee, call me any time). I saw quite a few trips coming the other way as I paddled through the narrows between White Trout and Big Trout. Most of those trips were heading down towards Sunbeam and beyond and I felt a moment of pity for each of them as I thought of the portages ahead. I also saw quite a few loons, most of whom didn’t seem to be heading anywhere in particular. Loons are like that. Loon on Big Trout. They’re everywhere man. Paddling into Big Trout my first thought was how happy I was to be paddling a lake that big on a calm day. I imagine a headwind on that water would be similar to paddling Opeongo in a big wind, and I can tell you from personal experience how awful that is. Fortunately, it was still calm and it took me very little time to cut across the north west corner to the Longer Lake portage. Along the way I passed by a couple of really nice looking island campsites near the portage to Shippagew that I would definitely like to come back that way some time to check out. So, fair warning Big Trout, you haven’t seen the last of me. 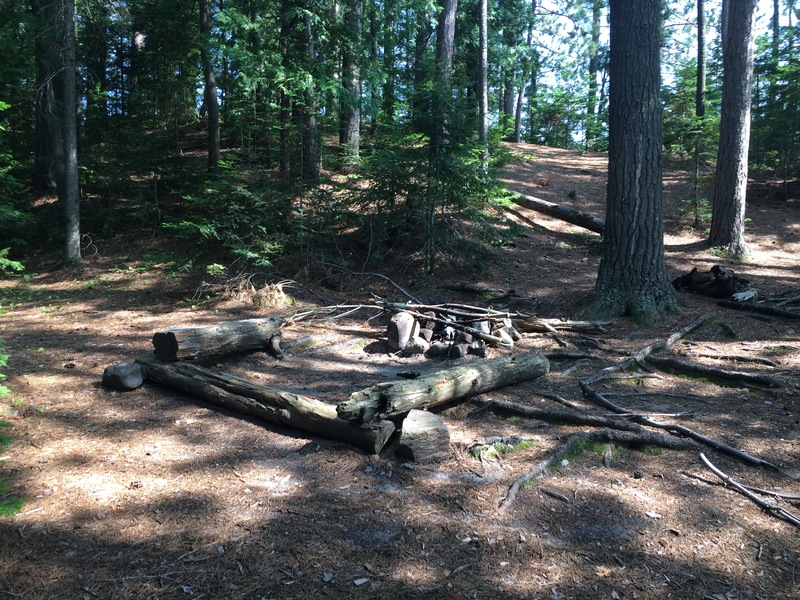 Speaking of nice looking sites, the first site after the (easy, well maintained) portage to Longer Lake looks like an interesting spot to stay for a night. It’s located at the outlet of the fast water connecting Big Trout and Longer and looks very picturesque from the water. I suppose the constant sound of rushing water would be a factor to consider; it’d either be very soothing or very aggravating. On the plus side, if your travelling companion is a big snorer then at least you’ll have a choice regarding what kind of background noise is keeping you awake all night. Longer Lake is a long, narrowish lake. Which makes sense, since it’s basically just the Petawawa River turning back into a river after a couple of big lakes. The north end of Longer is particularly nice. Once you turn into the marshy part that takes you to the first portage onto the Petawawa the current gives you a boost, which is a treat. There’s also a ton of birdlife; I saw the first of a few herons for the day in this part. It must have seen me too, because it took off like a bat out of hell, or, I suppose, a heron out of water. Longer Lake ends at a 40m portage beside a small set of rapids. 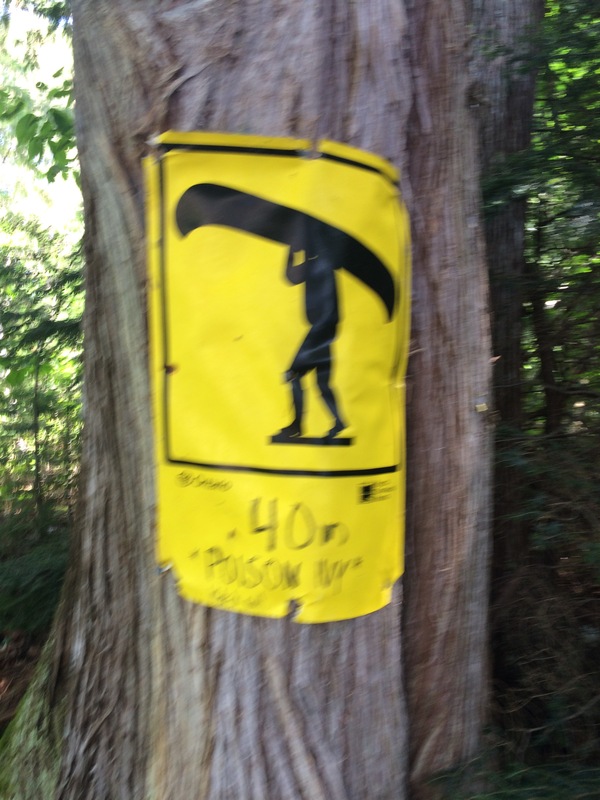 The portage sign tells you the distance and also says, in big capital letters, “POISON IVY!”. The good news is that you can definitely make it across the portage without turning into a punchline from an Archie comic. Basically, there’s a short path from one side of the rapids to the other that cuts through a patch of very green, very leafy something that, I imagine, is the poison ivy the sign warns about. As long as you step carefully, you can get across without brushing up against the leaves. The bad news is, if, once you’re done the portage, you decide to go enjoy a snack on the warm, sun drenched rocks beside the rushing water, you’ll be sharing those rocks with half the snake population in Algonquin Park. And I hate snakes. I may or may not have given a very manly shriek when I saw the first one coiled up near my feet. 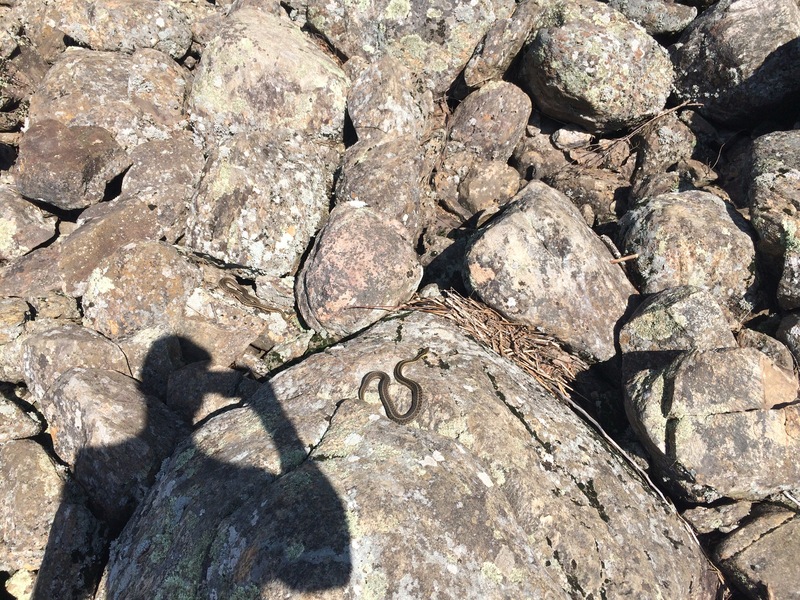 By the time I saw the fourth one in the rocks nearby I was all out of shrieks and had decided that maybe lunch could wait (if it looks like the video below is upside down, it’s not. Just hit play and it’ll work fine. I have no idea why it looks upside down here. Probably snakes). It’s a short paddle along the Petawawa to the next portage, a 75m into Red Pine Bay that goes around a short stretch of rapids. Having just completed Snake Ivy Run, I didn’t feel like doing another portage. This set of rapids is really just some faster moving water with a couple of small waves, so I decided to channel my inner Kevin Bacon and paddle the River Mild. I strapped everything in, made sure my life jacket was tight enough to cut off circulation, and pointed my boat downriver. 20 seconds later I was on the other side, giving the finger to the portage sign and paddling into Red Pine Bay. (One thing with rapids, whitewater of any kind is no joke. A lot can go wrong, including dumped canoes, wrecked canoes or, worst case, wrecked canoeists. If you’re going to paddle through any rapids make sure you know what you’re doing; scout the river and take every safety precaution. This is advice I will be ignoring in about 1,000 words). Looking out at Burntroot, where I should have stopped for the day. I came out onto Red Pine Bay and paddled through to Burntroot. Like Big Trout, Burntroot is huge. There was a bit of a headwind coming up, and I was getting both tired and hungry, so I stopped at a site on the eastern shore for lunch and a rest and to make my first bad decision of the day. At this point I had travelled just over 18km in about 4 hours. The sun was hot and I was drained. The site I stopped at on Burntroot was a really nice little spot for a solo camper. Great western view, nice onshore wind to keep the bugs away. It seemed like a great place to set up for the night. Except it was only around noon and I didn’t want to call it quits for the day, despite how tired I was. So, after about an hour break, I decided to push on. I shouldn’t have. I was already tired and I’d found a nice spot. It would have been much smarter to just relax, let my muscles recover from the day (and the day before) and enjoy a beautiful afternoon. But, I didn’t, so on we go. I made my way up Burntroot to the Portal Rapids between Perley and Burntroot. After chatting with the folks staying at the (awesome) beach site just south of the rapids, I decided to paddle through these as well. The folks on the beach site had recommended taking the left hand route, and I always listen to folks on beach sites, so I went left. It was a slightly harder paddle than the one into Red Pine Bay, and I may or may not have gotten stuck on a rock at the halfway point, but once again nothing too difficult. Perley, like Longer Lake, is really just a widening of the Petawawa. There are two main segments connected by narrower corridors, and the nice thing is it feels like you’ve got a bit of a current helping you out. Despite the current, I was now feeling pretty bagged. It was also getting late, so I decided to stop for the night on Perley. I set up camp on the point site in the middle of the north shore, and settled down for a well-deserved rest, just over 25km under my belt for the day. Remember earlier when I talked about not wanting to steal campsites from people who had already booked them? I checked in with my wife via my InReach once I had set up, just to make sure I wasn’t pirating someone’s site since Perley only has two sites on it. She looked it up and told me that Perley wasn’t just booked up, it looked to her like it was closed to camping. It was past 5 pm by this point, so she couldn’t get in touch with the Park for more information, but I was worried. I had no idea why it might be closed (tick infestation, bear infestation, bears infested with ticks etc. ), but there have been problems in the Park with blue-green algae on some of the lakes, and I didn’t know if maybe it had spread without me realizing it. Long story short, not knowing why Perley was closed, I didn’t want to spend the night there, particularly as I was out of water and would be drinking from whatever lake I settled on. So, come on down, bad decision number two. If I wasn’t staying on Perley, I should have turned around and headed back to Burntroot. It was the closest option, and I knew there were open sites nearby. But I didn’t want to backtrack, so I decided to push on to Catfish Lake. It was just past 6 pm when I set off from the site on Perley. The sun was already starting its descent for the trees and I had 10km of river, plus a few portages, between me and Catfish. I was paddling hard. I was helped, at least, by the current pushing me along the Petawawa, but it wasn’t exactly a high speed aquatic conveyor belt swooshing me downriver. The one thing I will say is that paddling the Petawawa in the evening hours is beautiful. The soft light makes everything stand out and I saw tons of wildlife, including a moose eating its dinner on the shore and quite a few birds. They, in turn, got to see a very tired guy paddling frantically downriver. So there was something for everyone. I reached the first of three portages between me and Catfish (Cedar Rapids portage). I briefly thought about trying to run these rapids but as I couldn’t see beyond a bend in the river, I decided that would be a bad idea. So instead, I threw both packs, plus my canoe, on my back and single carried across to save time. It did save time, but man, it did not save my back. Still, I made it across and set off on the river, happy that the sun hadn’t fallen too much more in the time I was in the woods. I did the same for the Snowshoe Raps portage, and was feeling pretty good about things. I wasn’t even thrown off by the tremendously creepy Blair Witchish stick figure thing someone had left hanging in front of the campsite sign on the site that’s just past the Snowshoe Rapids. Well, not thrown off by much … Fine, I was super thrown off. It was 100% creepy AF. Whoever put that thing there is an evil genius. No pictures of the Catfish Rapids, so here’s the stretch between Sunfish and Catfish instead. Enjoy! Then I got to the Catfish Rapids, the last portage into Catfish, and made another very poor decision. By this time the sun was pretty low in the sky, just above the trees. The Catfish Rapids portage is 365m but by then even that distance seemed like too much to be portaging. So I shot the rapids. I can’t stress how dumb this was. A) I was really tired by this point, and had managed to pull something in my left side along the way, so not at full strength. B) While I could see a lot of the river the portage took me around, I couldn’t see all of it. In other words, I would be paddling blindly into the last third of the rapids. C) I was solo and it was almost dark, so if I dumped or ran into trouble the likelihood of someone coming along to help was pretty much zero. In other words, this was dumb. Really dumb. Fortunately, I made it through. It got kinda sketchy just after the bend in the river but, through more luck than skill, I was able to ride things out without too much excitement. But yeah, it was really dumb (Also, my GoPro was dead by this point, so I don’t even have video of it. Sigh). Oh yeah. It turned out that Perley wasn’t even closed. Coming into Catfish with a giant meteor bearing down on me. Or the setting sun. It’s one or the other. Campsite Reports from this post. OMG this is an epic blog, I am still laughing! I’m sure your adventures were not “funny” at the time, but your write-up of them sure is. As the formula goes: tragedy (or in your case, snakes and drama) + time = comedy. Your blog, albeit informative, is pure hilarity! To add to the already high level of excitement, I got my map out an followed along your itinerary. 30K in one day, wow that’s dementedly brutal. At least you had your inReach (neat little gadget, that). Thanks for this awesome post, can’t wait to read your part 3!